Jack L. Davis, Carl W. Blegen Professor of Greek Archaeology at the University of Cincinnati and a former director of the American School of Classical Studies at Athens (2007-2012), here contributes an essay about the last days of Carl W. Blegen, Elizabeth Pierce Blegen, Bert Hodge Hill, and Ida Thallon Hill, the archaeological “Quartet” of Ploutarchou 9. The Blegen house at Ploutarchou 9 in the early 1960s. Saved from the demolitions of the 1970s, today the “Blegen house” is the seat of the J.F. Costopoulos Foundation. This short essay was composed to satisfy my own curiosity. Having recently edited Carl W. Blegen: Personal and Archaeological Narratives (Atlanta 2015) with Natalia Vogeikoff-Brogan and Vivian Florou, it occurred to me that virtually the only aspect of Blegen’s life that had received no attention was its end. Nor had we, or indeed any of the authors who contributed to that volume, written of the later lives of the four amazing individuals who formed “The Quartet” that resided at 9 Ploutarchou St. in Athens: Blegen, Elizabeth Blegen, Ida Thallon Hill, and Bert Hodge Hill. 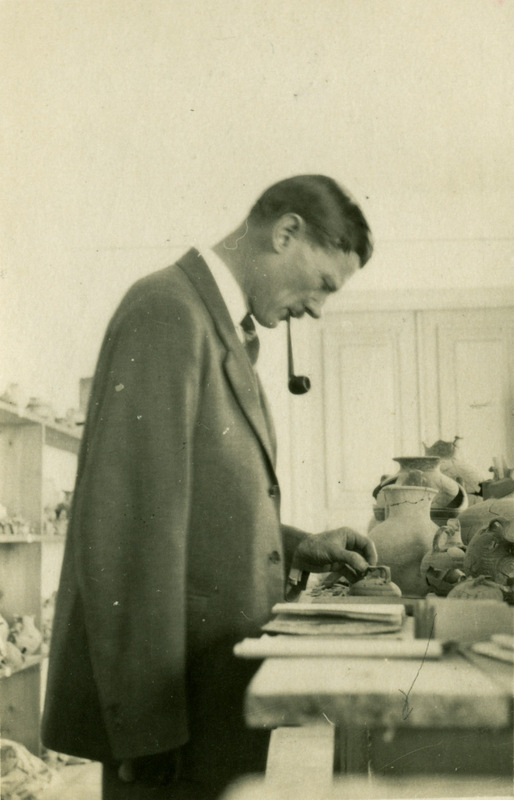 Jack L. Davis, Professor of Greek Archaeology at the University of Cincinnati and former director of the American School of Classical Studies at Athens (2007-2012), here contributes to the Archivist’s Notebook an essay about his favorite topic, Carl Blegen and the Pylos excavations. He also describes the recent discovery of Marion Rawson’s personal diaries. The spirit of Carl Blegen surrounds us. In 1972 I came to the University of Cincinnati to study Aegean Prehistory, the field that Blegen helped to create. (Curiously, Blegen himself objected to the term “prehistory” on the grounds that early humans had a history, preferring to call it “Preclassical archaeology”). I am the Carl W. Blegen Professor of Greek Archaeology at the University of Cincinnati. Our department is in Blegen Library. 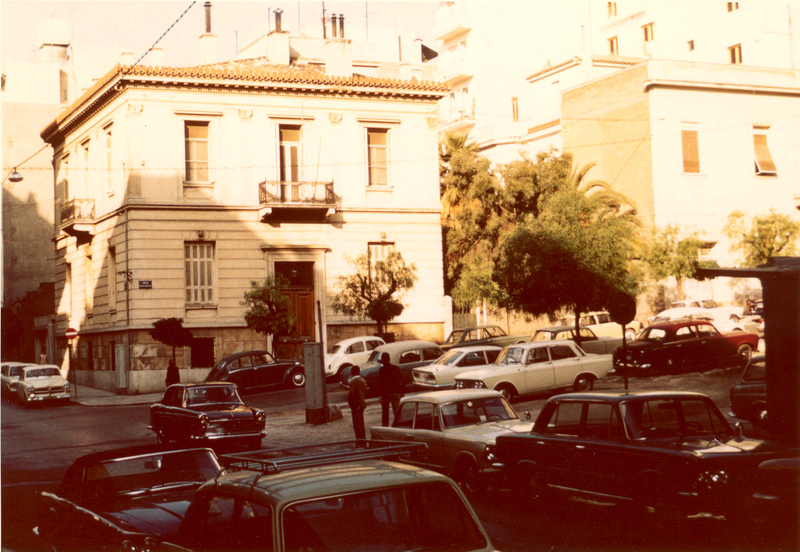 We use the Blegen Library of the American School of Classical Studies at Athens. 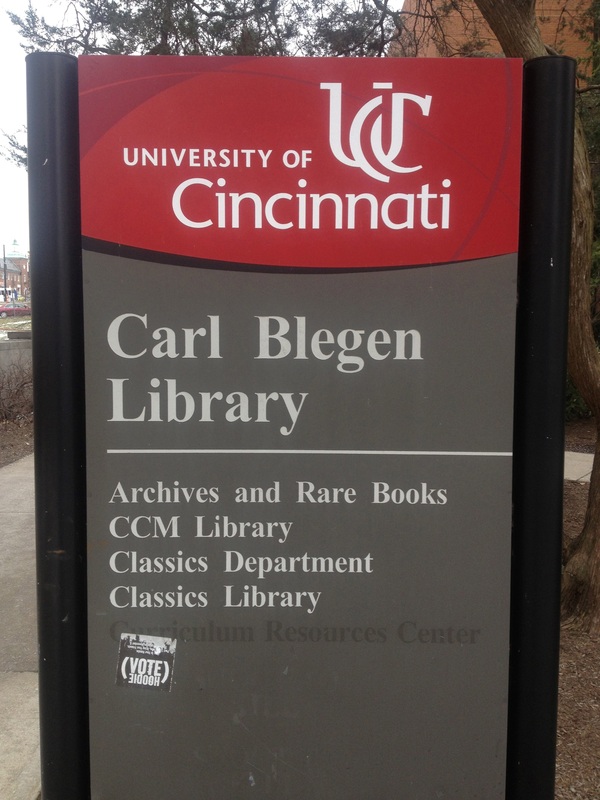 But I never met Carl Blegen — and, in fact, until last May, when we discovered an old audio tape in a file cabinet at UC, I had never heard his voice. CWB, as he signed himself, died in 1971. In his final months he was nursed in Athens by his sister Martha, then buried in the First Cemetery beside his beloved wife, Libbie, Bert Hodge Hill, and Ida Thallon Hill. Of the quartet that lived at Plutarchou 9, he was last to depart. The story of CWB and his world maps Greek prehistory over six decades, from its fumbling beginnings until its emergence as a modern scientific discipline. In May 2013 in Athens, my friends Vivian Florou and Natalia Vogeikoff organized a conference about the Blegens with me: “Carl and Elizabeth Blegen Remembered. Ploutarchou 9 Celebrated.” See http://www.ascsa.edu.gr/index.php/news/newsDetails/ascsa-co-organizes-colloquium-on-carl-and-elizabeth-blegen. Chasing the spirit of CWB has been rewarding for us, particularly in that we have had the pleasure of making the acquaintance of several of his associates. One initial goal in so doing was to locate excavation records missing from the main Palace of Nestor archive. (It was transferred, after CWB’s death, from Ploutarchou 9 to ASCSA). Thus several years ago we contacted Bill Donovan, one of the authors of the third volume of The Palace of Nestor at Pylos, and Professor of Classics, emeritus, at MacAllister College. Bill still had in his hands his notebooks that recorded excavations of chamber tombs in the Tsakalis cemetery.